About this post: Satpura National Park, home to Satpura Tiger Reserve and Pachmarhi hill station in Madhya Pradesh – is a unique responsible travel getaway in India. Staying at Forsyth Lodge in Satpura National Park, I was able to explore Denwa river, visit Pachmarhi in Madhya Pradesh, learn about responsible travel in India and experience the fascinating safaris of Satpura Tiger Reserve. Highly recommended! The forest is so silent that I can only hear the rustle of the sal leaves under our feet. The white, barren ghost tree holds my gaze awhile. The sun’s golden rays shine through the tree’s branches, as the forest sleepily awakens. Our naturalist and guide are deep in discussion about the previous day’s unexpected bear sighting. They suddenly stop in mid-conversation, for the distinct sound of a sambar deer’s alarm call has broken the unusual silence of the forest. A predator – most likely a tiger, bear or leopard – is in the vicinity. As we head in the direction of the deer’s call, langurs chime from the trees above, their cough-like alarm call giving me goosebumps. Perhaps you have been on a safari in an Indian national park, and felt the hair-raising excitement of being on a predator chase? I felt it too, except mine was laced with a tinge of cold fear. Because we weren’t in a jeep as we drew nearer to the alarm calls. We were on foot… with only a stick and pepper spray to protect us from a potential predator in the forests of Satpura National Park in Madhya Pradesh! On the edge of Denwa River. Over the years, I’ve fallen in love with the protected national parks, tiger reserves and wildlife sanctuaries of India in Madhya Pradesh, Maharashtra and Uttarakhand – including Panna, Bandavgarh, Kanha, Pench, Tadoba and Jim Corbett. But in Satpura National Park, while staying at the environmentally-conscious Forsyth Lodge, I fell even more in love with the forests, the rivers, the sunsets, the hills, the stories, and starry, starry night skies. Misty morning and sunrise on the Denwa River. As an orange ball of fire rose from the misty horizon, we floated along silently, the stroke of each paddle taking us further from the roar of jeeps and the chatter of people. The Denwa River, perhaps fierce and free-flowing once, meandered gently after being dammed several kilometres from here. On its shores played snipes and wagtails, and grazed wild boars, oblivious to the three figures on our rustic canoe. I’ve always associated early mornings in Madhya Pradesh’s national parks with the rumbling of jeeps, but to see and hear the forest wake up without feeling like an intruder, was my kind of safari. A local guide contemplates the beauty of Denwa. As we followed the alarm calls of sambar deer and langurs on foot, I shuddered at the idea of sharing the ground with a tiger, leopard or bear. The four of us – my friend and I, and our naturalist and guide, barely took a breath in those few minutes which felt like an eternity, as we tip-toed closer to the dense foliage which seemed to be the sight of the commotion. Adrenalin rushed through my body and goosebumps covered my arms, as we quietly speculated what the predator could be. Then just as suddenly as the alarm calls had started, they stopped, even as I imagined hoarse breathing piercing my ears. Too bad we were no tigers, for a bunch of jeeps and their curious spectators were gawking and flashing their shiny cameras at us when we emerged from the forest to cross the nearby jeep trail! It is one thing to walk in the safe company of a naturalist and guide, quite another to be one of two lost souls cycling through the buffer zone of Satpura Tiger Reserve. We crossed blooming yellow mustard fields, carried our bikes across a dry riverbed (presumably having lost our way), and cycled on the edge of a deep gorge, with no plan B if we came face to face with a big cat. Oh, the thrill! Luckily for us, the wilderness was alive with chirping, and the only eyes that met ours were those of eagle owls, camouflaged in the bushes. Also read: Panna National Park: The most beautiful in India? Looking for vultures across the gorge in Pachmari. I couldn’t shake off the idea of Panchmarhi, a hill town tucked away in the vast Satpura National Park, and jumped at the chance of driving there with my naturalist from Forsyth Lodge, two hours from Satpura Tiger Reserve. Those winding roads, dense sal forests and British-era churches made me forget that I’m still in Central India. Away from the characterless town, we hiked with a renowned local guide to secret panoramic sunset spots, a hill with almost a dozen vulture nests (viewed from a safe distance across a gorge), and spotted the rare tree shrews. The biggest surprise – driving at night to an open field to see a million twinkling stars in the night sky above us… and spotting a civet running into the bushes as we drove back! A sloth bear crosses our path on a jeep safari. With much anticipation, we took the public boat across the Denwa River and hopped on to a forest jeep on the other side – because those forest trails, brimming with activity on the ground and up in the air, never fail to get my adrenalin racing. A mugger crocodile basking in the sunshine on the banks of a pond with its mouth wide open; a wild gaur with a one day old calf; a giant squirrel playing in the branches of a tree; magnificent birds (my memory always fails me on names); a jungle cat in the bushes; a sloth bear casually nibbling on grass and crossing the path before us, and another one wandering further into the wilderness… oh, can I go back to the forests of Satpura already? Confession: I feel sorry for those who miss out on the wild ways of the forest by only being interested in spotting a tiger. Our hut at Forsyth Lodge, under the starry night skies! I can still close my eyes and walk by the light of dimly lit lanterns, my head turned skywards as stars begin to appear everywhere above me. I can still hear stories from Greek Mythology, of Orion and Artemis, as we decipher constellations in the dark skies. I can still taste mahua – a local liquor brewed from mahua flowers (the sloth bear’s fav) – as we talk about the day’s sightings with the naturalists and fellow travellers. Those pre-dinner drinks and starry skies on the rooftop of Forsyth Lodge… I can’t wait to go back someday! Look out for my upcoming Instagram contest to win a stay at Forsyth Lodge! 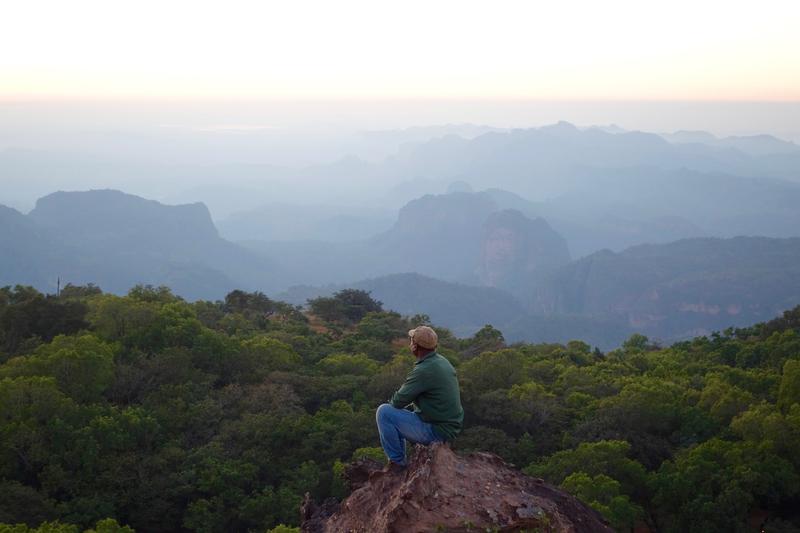 My naturalist having a moment with the incredible night sky in Pachmarhi. How to reach: The nearest airport to Satpura National Park is in Bhopal, from where the park is a 3-4 hours drive. It’s worthwhile stopping at the UNESCO World Heritage Site – Bhimbhetka Rock Shelters – enroute. Where to stay: I absolutely loved my stay at Forsyth Lodge, located in the buffer zone of Satpura Tiger Reserve. The lodge was set up by a naturalist who has been instrumental in bringing a conservation-focussed model of tourism to Satpura. The huts are built with mud and slate in local architectural style – minimalistic yet luxurious – and only 10% of the total land has been used for building. The remaining barren acres are being transformed with indigenous trees and shrubs. Most of the produce is sourced from local farmers… a special shoutout to the chefs for some incredible vegan food and desserts (inform them of food preferences beforehand). When to go: Like most national parks in India, Satpura is closed from July to September for the rainy season. A local chef whipping up traditional food at Forsyth Lodge. Have you been to Satpura National Park? Which national parks in Central India do you love most? I was hosted in Satpura by Forsyth Lodge; lucky me! Join The Shooting Star on Facebook and Twitter and Instagram for more adventurous yet responsible travel experiences around the world. Brilliant shivya…..u just portrayed de real thing nd i can also read between de lines as well….grrrrt…thx….all de best…i hv heard of it b4 as well…. hopefully i hv got my jugalbandi sort of itinerary….do keep an eye on my modest posts on fb. Oh this is going on my bucket list!! So worthy of it, Courtney! Very nicely written! Enjoyed this a lot! OH MY GOD!! This is beautiful. I love it. Thank you for sharing. I have missed you and your posts. I hope you are doing well my friend. I enjoyed traveling with you through these beautiful pictures. I don’t want to assume, but did you take these pictures? They are beautiful. Aww thanks, it’s just been hard to find time to write recently, but I’m working on lots of new posts 🙂 Glad you enjoyed this one; Satpura is unique and beautiful, a place to be experienced in person. Except for the Pachmarhi and cycling ones – taken by my friends – the pictures are all mine! You’re welcome. That’s awesome. I’m sorry you haven’t had time to write. That’s awesome. I can’t wait to read them. I can’t wait to see it in person. It looks beautiful. Really that’s awesome. You took some really nice and beautiful pictures. Your friends did as well. Just beautiful. Madhya pradesh♥ you should definately go to kahjuraho also!! I’ve been there a while ago, and loved it. Wrote a post contemplating how India “closed up” so much since those temples! Absolutely splendid narration. The way that you weave your stories in a travelogue is really interesting. For years, I have tried to avoid National Parks because I find them too crowded and expensive for my modest style of travel. Now I realise, avoiding them is not the solution. Hopefully in the near future, I am going to explore National Parks and find a way to stay away from the crowded areas. Thanks for the wonderful information about Satpura. Love the photographs, especially the night shots. Thanks Shubham! I avoided NPs for a long time too, until I travelled to my first one and fell so in love. The trick is to choose to stay at a place that’s conscious of its environmental impact and serious about conservation, I think. I have visited Satpura National Park 2 years ago. It’s one of my favorite places to visit ever. Haha, don’t wait for me, plan your own adventures! That was one hilarious moment indeed! Hope you make it there soon. Thanks Megha! Hope you make it soon enough; it really is an incredible part of the country. Well written. Would love to visit Satpura sometime. Thanks for sharing. However, whenever I see “hosted by…” or “sponsored by…” at the end of any article, I feel confused–not really understanding what’s true and what’s exaggerated. If you’ve read my blog for a while, you’d know that I’m forthcoming about my opinions of places, hosted or not. Your call though! Periyar wildlife is perfect for nature lovers if you are one😉. Thanks for the lovely post.. can’t wait to visit this place.By the way,is your wanderlust taking you to North East anytime soon? Loved the narrative Shivya. Making a mental note of Satpura and Forsyth Lodge to experience soon. wow that place is looking awesome and best place for adventure. you capture beauty of satpura national park. these are amazing. if you had limited mobility, how much of the park is accessable? I’m afraid I didn’t look into that. But it could be difficult, considering access to the park is on a boat, walking up to the forest on the other side, then a jeep. Beautiful narration. I have never been to Satpura National Park, but I could feel the free flowing Denwa River, sky-high Panchmarhi and a blissful night sky. Beautiful narration. I have never been to Satpura National Park, but the Denwa River, the sky-high Panchmarhi and the taste of locally brewed Mahua are so familiar to me now. i am some what of a newbie to internet marketing and blogging.So with that being said. i am very glad that i found this blog post. i’ve heared talk of “Why Satpura National Park is the Most Unique in India.” but never really new what it was all about. however i can say that i understand a lot better now.i plan to stay connected to your blog can’t wait to see what you’re going to write a next .Thanks. Satpura indeed is unique. I liked the fact that it is lesser known compared to the other big tiger reserves and the tourist flow was limited. I did not have a clear view of the bear but saw and clicked many other things. But I wish I hadn’t consumed too much of Mahua liquor at night and had taken a few shots of the starry sky at night like you did. Superb blog…It was worth reading, I hope one day you read my Blogs too. Beautifully written. It was a pleasure to read. Great narration. The way you promote sustainable tourism is really appreciable. It is time to change how we look into tourism. Looking forward to reading about many such new places from The Shooting Star. Thanks for sharing this post. Felt very happy in reading your post. Very Informative. Excellent write up. Good photography. Excellent location. Adventurous travelling personality. I like it. Previous PostHow Croatia Compelled Me to Rethink Travel Blogging. Next Post“I Love Spiti” – How Travellers Must Help Save India’s Surreal Himalayan Desert.